The Theewaterskloof Dam, above, which supplies most of Cape Town’s potable water, is seen on Feb. 20. When he turned on his bathroom taps and only a few drops trickled out, Yazeed Kamaldien knew the crisis had arrived. In a panic, he rushed to the shops, searching for water buckets and storage drums. The rationing had begun. Cape Town's government was throttling the water pressure in its pipes, neighbourhood by neighbourhood, and Mr. Kamaldien's apartment block was one of the first to be hit. "I was shocked," he recalls. "I didn't know why it was happening. But the city is trying to change behaviour, and for me it had that impact. It was not pleasant, being without water." Mr. Kamaldien, a writer for a local newspaper, began stockpiling five-litre bottles of water and figuring out new ways to wash his dishes and recycle his waste water. He spent half a day searching the shops for a garden water sprayer to serve as a crude substitute for his shower. Even when his taps returned to normal a few days later, he continued to limit his water use. Today, after months of relentless effort by Mr. Kamaldien and millions of other residents, Cape Town has reached an unexpected victory. It is on the brink of defeating Day Zero – the much-feared moment when it would become the world's first major city to shut down the supply of water to its homes. Cape Town's water-conservation campaign – a dextrous combination of voluntary and forcible methods – has been an extraordinary achievement by any measure. Despite the city's fast-growing population, its water consumption today is less than half of what it was in 2015. Even compared with other drought-stricken regions internationally, it is now believed to have the lowest consumption of water per capita of any developed city in the world. Its residents, required to limit themselves to 50 litres of water each day to avoid Day Zero, have learned a whole new set of skills: how to complete an entire shower in 60 seconds, how to defer their laundry and flush their toilets only once a day, how to minimize washing by dining on paper plates. At the city's museums and convention centres, bathroom taps have been switched off and visitors are given hand sanitizer instead. Mandatory cuts in water pressure, along with remote-management devices to control the biggest users, have completed the rationing task. People collect drinking water from pipes fed by an underground spring, in St. James, Cape Town on Jan. 19, 2018. Cape Town is just a forewarning of a widening global trend. Cities from Brazil to Mozambique have been forced to ration their water supplies in recent years because of drought. More than half of the world's largest 37 aquifers have declined since 2003, a study found. "If the current patterns of consumption continue unabated, two-thirds of the world's population will be facing water shortages as a daily reality by 2025," Bolivian President Evo Morales told the United Nations Security Council last year during Bolivia's presidency of the council. As climate change intensifies and water scarcity becomes more severe worldwide, Cape Town will be a model for other cities. Its water-management tools and techniques will be studied and adapted. This could be the world's future, and Cape Town shows that it can be survived. 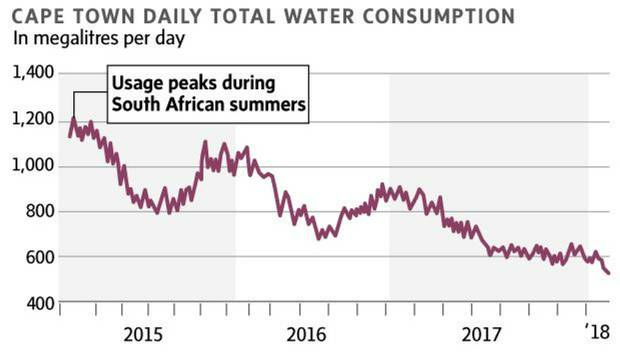 "We are the guinea pigs for the world in how to overcome this," said Sisa Ntshona, chief executive of South Africa's official tourism agency, which is heavily involved in the Cape Town water crisis because the city is a tourism hub. Cape Town is heavily reliant on rain-fed dams to provide its water supply. But those dams are steadily emptying. For the past three years, Cape Town has been suffering the worst drought in its recorded history – a drought so severe that scientists have calculated it should occur only once in a millennium. It was the culmination of a long-term trend in which low-rainfall years have become increasingly common in Cape Town. "If people around the world ever thought climate change is just a fable or fiction, we in South Africa are now seeing the real effects of climate change," President Cyril Ramaphosa said during the World Economic Forum in Davos, Switzerland. Cape Town's mayor, Patricia de Lille, provoked global headlines in late January when she announced that the city had reached "a point of no return." She said it was "very likely" that the city would soon reach Day Zero, when residents would have to queue for water. A disaster-operations centre was launched, and South Africa's army began plans to deploy soldiers to guard the water tankers and neighbourhood taps where water would be distributed under the harsh Day Zero queuing rules. But since then, Day Zero has been repeatedly pushed back, from its earliest projected date of April 12 to its current date of late August – partly because of a reduction in dam water for farms, but also because of a drastic decline in urban consumption. Normal winter rains, assuming they arrive, will postpone Day Zero by a further year. 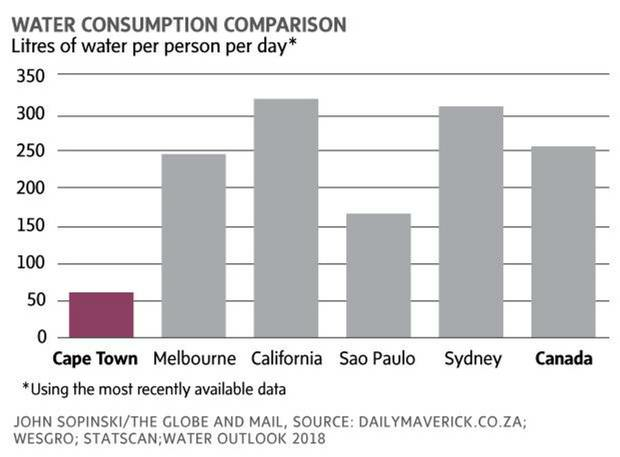 As recently as 2015, Cape Town's four million residents were consuming a total of about 1,200 million litres of water a day. Today they consume less than half of that amount: just 516 million litres a day. The limit that the city has now imposed, 50 litres a person daily, is just one-fifth of average daily consumption in Canada. Over the past year alone, the city's residents have slashed their water consumption by 44 per cent. "I think this has probably never been done anywhere in the world at this scale over this period of time," said Xanthea Limberg, a Cape Town city councillor. "Cape Town is becoming a case study of how to respond to this kind of drought situation," she told a media briefing. "The results have been tremendous." To make the achievement even more impressive, this is the second time in the past 15 years that Cape Town has undertaken a massive water-conservation drive. After an earlier drought in 2004 and 2005, the city launched a campaign to detect leaks, recycle water, replace pipes, reduce the water pressure and ban automatic-flushing toilets. Free plumbing was provided to low-income households to fix leaks. 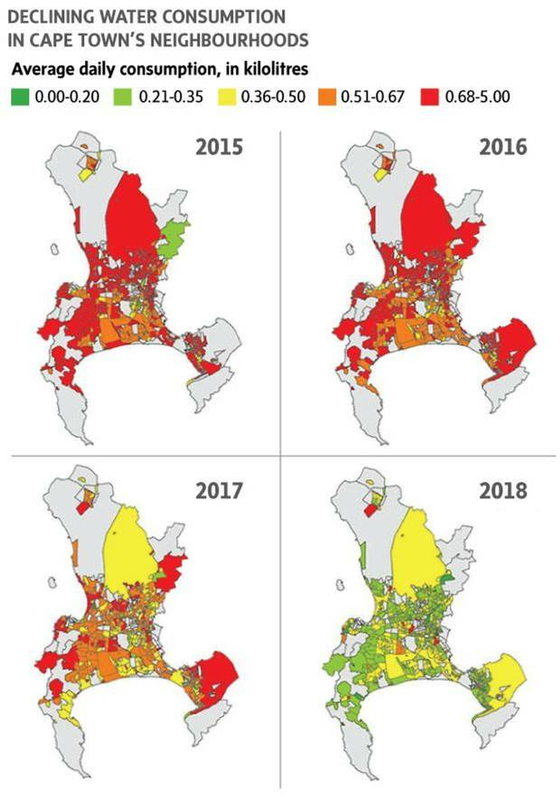 The city was able to prevent any rise in its water consumption for the next decade – despite a 30-per-cent increase in the city's population. For the latest campaign, with Day Zero looming, more drastic methods were needed. By early February, about 70 per cent of the city was subject to water-pressure reductions, and about 240,000 water-management devices had been installed on the pipes of the biggest household users to allow the city to control their supply. Fines were imposed on illegal water users. Water tariffs were boosted sharply for the heaviest users. More controversially, the city named and shamed the heaviest water guzzlers, using the weapon of peer pressure to nudge them into compliance. It published the addresses of the 100 homes with the highest water use. It released an online map of every street in the city, with green dots marking the homes that had complied with the rationing rules. It urged residents to use a snitch line to report excessive users. In its media campaigns, the city emphasized that everyone needed to save water to prevent the catastrophe of Day Zero. It was sometimes criticized as a scare tactic – but it worked. "We needed to get a big fright," said Cindy Muller, director of Gold restaurant, a 450-seat establishment in Cape Town. "We're all scared. It's all we talk about. But we have to get out of that and into being creative. Capetonians are incredibly creative, and we're going to find creative ways that the rest of the world can learn from." She collects spring water and boils it to provide much of the water for washing and cleaning at her restaurant. And she has introduced a host of other measures: water-saving aerators on bathroom faucets, hand sanitizers, waterless urinals, recycling of washing water and paper coffee mugs for her staff. She sends her laundry to a company that uses a private supply of borehole water, and she goes to a hairdresser who buys bottled water to wash hair. "He went off the grid last October," she says. At home, she uses only 15 litres of water a day. "I don't think it's such a sacrifice," she says. "We are adjusting our privileged lifestyle." Restaurants across the city have made changes: ending their use of table linen and water jugs, switching to disposable cups, using paper towels instead of napkins and reconfiguring their menus. Some are dropping pasta dishes, because of their heavy water use, or steaming their vegetables instead of boiling them. Cape Town's most famous restaurant, the Test Kitchen, routinely ranked among the top 100 in the world, is introducing a reduced-water menu in April. The menu, to be called the "Drought Kitchen," will eliminate 90 per cent of its chinaware, to reduce the need for washing. Each dish will be served on a slice of impermeable cardboard inside a picture frame. Cape Town’s most famous restaurant, the Test Kitchen (above), routinely ranked among the top 100 in the world, is introducing a reduced-water menu in April. The menu, to be called the Drought Kitchen, will eliminate 90 per cent of its chinaware, to reduce the need for washing. Each dish will be served on a slice of impermeable cardboard inside a picture frame (below). "For me, it's scary and it feels risky," says Luke Dale Roberts, the master chef who founded the restaurant. "But we're one of the front-runners, so I think it's up to us to set an example. If we're willing to throw caution to the wind, then others will follow." Other sectors, too, are saving water. Some gyms have closed their sauna and steam rooms, while switching to non-potable water for their pools. Hotels are removing their bath plugs to discourage guests from having baths. Middle-class residents and city politicians are boasting of their infrequent showers, their reused clothes and their unwashed cars. "It's a badge of honour now to drive around in a dirty car," said Hannerie Visser, who runs a design studio in Cape Town. Her studio has experimented with creating a waterless dinner menu, giving preference to salt-tolerant crops, using seawater to cook vegetables and offering food such as ostrich fillet and ostrich eggs because ostriches don't need to drink water. "I think it's important that we re-examine our relationship with water," she says. "This should stay our new normal." 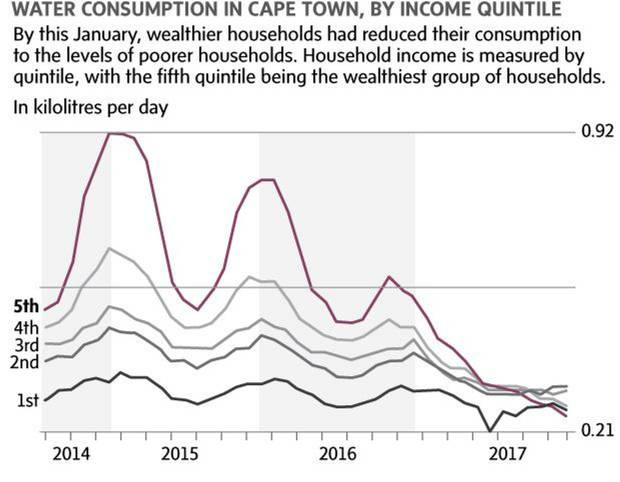 But while the affluent and the middle class are adjusting their lifestyle, it's nothing new for Cape Town's poorer districts. Sand blows across a normally submerged area at Theewaterskloof dam near Cape Town Jan. 21, 2018. In one of the world's most unequal countries, access to water is highly unequal, too. A million people live in shacks in Cape Town's sprawling townships and squatter settlements. They are a quarter of the city's population, yet they consume only 4.5 per cent of its water. While the rich can drill boreholes and buy storage tanks to create their own private supply, separate from the metered system, most of the poorest million have no piped water in their homes. So they must trudge to communal taps to collect water in buckets and jerry cans – the same scenario that is feared as Day Zero for everyone else. 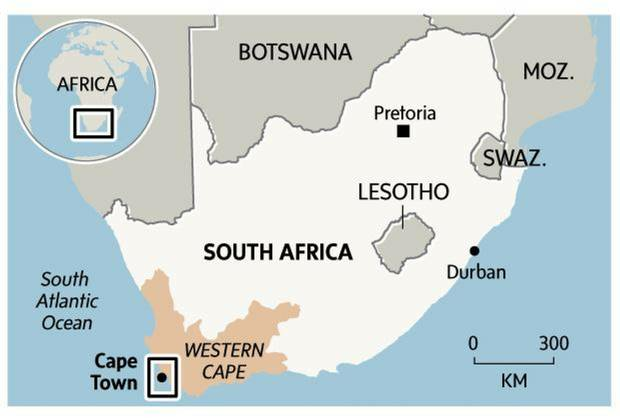 "South Africa's cities were never made for everyone," said Claudia Gastrow, a lecturer in the University of Johannesburg's department of anthropology and development studies, in a recent commentary. "Poorer, usually black, South Africans have been dealing with water scarcity for decades. "What is new is for the wealthy to have to realize that they are not living in the Global North; that their lush lifestyles cannot cushion them from the realities that they choose to ignore."